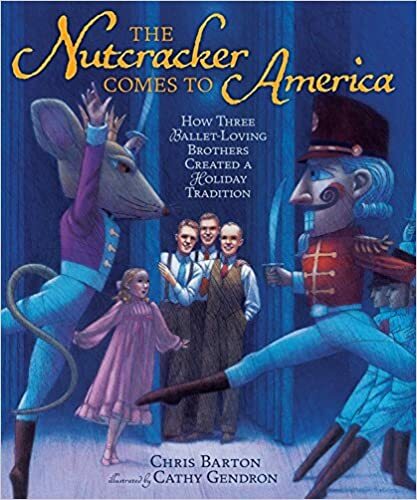 The Nutcracker Comes to America: How Three Ballet-Loving Brothers Created a Holiday Tradition by Chris Barton, illustrated by Cathy Gendron. Summary: Although the Nutcracker ballet seems like a timeless holiday tradition, it’s only been around since the second half of the twentieth century. Three brothers from Utah, Willam, Harold, and Lew Christensen, were responsible for bringing the Russian ballet to the U.S. The Christensens came from a dancing family and grew up to become dancers, vaudevillians, and, eventually, teachers and producers. During World War II, money and dancers were both in short supply. The brothers were working in San Francisco and needed a hit to keep ballet alive in that city. When Willam heard someone whistling Tschaikovsky on a city street, he was reminded of a production of the Nutcracker he had been involved with years before. The brothers’ low-budget production premiered on Christmas Eve and was a huge hit. Over the next several years, the show spread to other cities across the country, so that by the 1960’s, the Nutcracker tradition had taken hold. Back matter includes notes from the author and illustrator about their research, a timeline, a summary of the story of the Nutrcracker, and suggestions for further reading. Grades 2-5. Pros: I was surprised to learn how recently the Nutcracker came to America. The history was interesting, and the illustrations, inspired by Edgar Degas, capture the grace and beauty of ballet. The conversational tone of the text keeps the story moving along. Cons: Some of the details of the brothers’ lives seemed extraneous to the main story. A little editing might have made this a better read-aloud for younger readers.